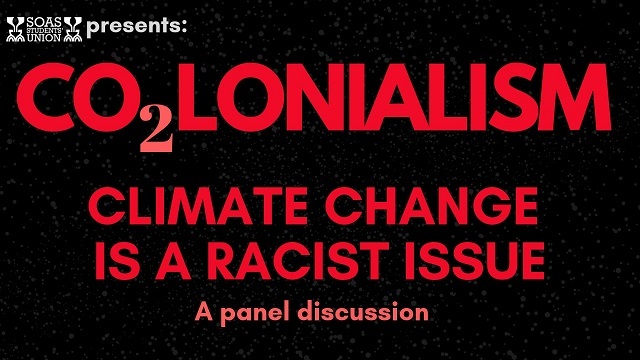 Your Vice-President (Society & Citizenship) Zamzam Ibrahim shares some of the discussion from a panel event she recently chaired called ‘C02lonialism: climate change is a racist issue'. Organised by SOAS Students' Union, speaking on the panel was the formidable SImmone Ahiaku from People & Planet and the ever-inspiring Asad Rehman from War on Want. Yes, we know all about climate change. We get it. But what about it relates to race? In introducing the panel, Youssra Elmagboul (Co-President Equality & Liberation at SOAS SU) spoke about how the UK has recently been exposed as the biggest carbon emitter per capita (person), yet it is one of the least vulnerable to climate change. The countries most vulnerable are those least responsible. They are predominantly based in the Global South, and are disproportionately communities of colour. However, this nuance of race is often missing from mainstream narratives about climate change. And naturally I echoed this sentiment as chair. I started as an anti-racist campaigner, and it took me a while to link climate change into my work. Sustainability is an incredibly white sector so it was alienating to say the least. However, now I get it. Climate change and its impacts can be linked to any injustice, including racism, sexism, ableism and the rights of refugees - who are often fleeing conditions created by the Global North. So, given race intersects so deeply with climate change, why isn’t the climate movement talking about it? Asad highlighted how in the mainstream, climate change is presented through a narrative that is technical and scientific - facts-based. This is a conscious decision. If it is rationalised and measured, it is possible for the politics to be taken out of it. And climate change is deeply political. With its roots in the neoliberal capitalist system it has to be. Our economic system individualises us and creates hierarchies based on various aspects of our identities including race, gender, class and citizenship status. As part of this discourse of oppression - which the economic system requires to maintain itself - people are individualised and divided from one another. This leads to individual behaviour change being touted as the way to “transform” the system. And for sure recycling has its place, but as Simmone flagged, over 70% of carbon emissions are coming from just 100 fossil fuel extractor companies, like Shell and BP. This means we can recycle as much as we like, but by placing that at the centre of the action needed we are ignoring the corporate power and privilege at the core of climate breakdown. It is only through challenging and breaking this apart as a collective movement that we can tackle climate change. And this means we have to undo all the systemic injustices and oppressions to achieve it. You simply cannot have climate justice without racial justice, gender justice etc. This is fundamental because as Asad said, throughout history, the system has been willing to sacrifice people (disproportionately people of colour) for profit, and this is no different. We need equity. For everyone. But it’s OK right? Didn’t the IPCC just release a report saying we have 12 years to act? Yes, Simmone spoke about this - as well as the racism inherent within the coverage of it. In the most recent report from the Intergovernmental Panel on Climate Change (the IPCC you might know it as) people were fully reproducing the global climate conversation which centres the experiences of white Europeans. Whilst in the West/Global North people may not be being significantly impacted by climate breakdown right now, meaning it is possible for them to use 12 years as their deadline, this is not a privilege that folk on the frontlines in the Global South have. Communities of colour are disproportionately on these frontlines - experiencing the impacts of droughts, desertification and food insecurity, as well as fossil fuel extractor operations themselves with displacement through land grabs and an increase in violence against women and girls where extractors operatate. This is all happening right now, it’s just not being directly experienced by those in the Global North. Basically, we need to unlearn and de-centre Global North perspectives and narratives? Pretty much. At the core of this is the need to unlearn and de-centre the white gaze of colonialism and imperialism, which the Global North’s current existence is based upon. Asad highlighted how power needs to be a part of our climate change narratives because it cannot be understood without placing it within the context of European colonialism, the slave trade and the imperialist invasions of Iran and Iraq for fossil fuel reserves. These colonial and imperial legacies continue to shape power relations across the world today, making climate change organising intimately bound up with systemic racism. Asad spoke about how to ignore this is to fall into the trap of de-politicising. For example, the rhetoric of certain groups that focus on the extinction of humanity as their main focus and call to action. Not only does this focus silence and marginalise the experiences of those who are already feeling the impacts of climate change in the Global South, but by doing so creates a hierarchy in which we only start to take notice once the lives of those in the Global North are beginning to be impacted. To overcome this the climate movement needs to recognise the impacts of climate change as they are happening right now. Across the Global South, from Pakistan to Sub-Saharan Africa, people already impoverished by the neoliberal economic system are being forced from their lands and livelihoods by extreme temperatures and weather. We need to do more to amplify these experiences. What else do we need to move away from racist western narratives of climate change? Simmone highlighted how western narratives employed by the environmental movement draw dichotomies between people and the land. The land is constructed as lacking in agency and the white saviour complex is projected onto it because it needs to be “saved”. But the land can handle itself. It always has. This kind of narrative has also historically and in the present day been used to dehumanise people of colour. Through such a lens slavery and colonialism were legitimised. To work through this, Global North narratives need to amplify the voices, stories and resistance of those on the frontlines of these interlinked injustices. For example, through making connections premised on meaningful solidarity with indigenous communities, whose rights are systematically violated in a multitude of ways due to state governments and fossil fuel extractors. By making links with those already resisting we also partly undo the silencing of communities of colour already fighting the climatic changes we supposedly have 12 years to wait for. So I guess this isn’t about the ‘just’ transition but the ‘justice’ transition? That’s right! Asad highlighted how you can only tell people to live within the system if you’re not dying from the system, and sadly too many people are. These people are disproportionately black, brown and poor bodied. The whitewashing of climate change organising needs to end, as well as the powerful vested interests of governments (vested in their pursuit of profit by any means necessary) who continue to sit on their hands whilst poor people of colour across the world are dying. At the core of what we need is justice. And for that we don’t need more white saviours celebrating a global Paris Agreement that fails to deliver meaningful action; we don’t need climate finance, which would see more debt-creating loans to the Global South; and we definitely don’t need net-zero initiatives that will justify more land grabs. What we do need is a vision of a fairer, more equal world that makes sense to people. That doesn’t see fossil fuel divestment as an end point, but sees the potential of community energy and a democratised energy system through reinvestment. We need an acknowledgement that the poorest countries are already doing more to tackle climate change than rich countries and that the Global North needs to step up and transfer technology. We need the polluters to pay. And for corporate power to be undone. The destructive operations of transnational companies - like fossil fuel extractors - often take place in the Global South where folk are resisting this everyday, so those based in the Global North need to take on the companies here, where they are domiciled. This is a way to act in solidarity. So if you’ve read this blog and you’re wondering what to do, as Simmone said, the place to start is by “locating your power and privilege and then using it”. To smash it up. Huge thanks to Simmone and Asad for sharing their wisdom, and to SOAS Students’ Union for organising such an incredible event.